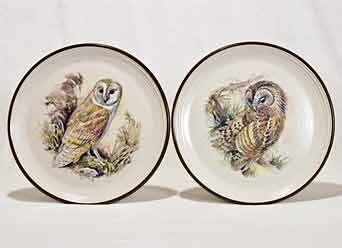 Pair of Purbeck owl plates - 8⅝" (219 mm) diameter. Purbeck Pottery was established in Westbourne, near Bournemouth, Dorset in the mid-1960s. The company produces a range of table and decorative studio-style stonewares designed by Robert Jefferson, previously of Poole Pottery. The company moved a few miles from Westbourne to Poole in Dorset in 1995.